For blue wildebeest in the Kalahari, life is tough. As a water-dependent grazer, survival is all about finding enough grass and access to water during drier years, whilst avoiding predation. Before the 1970’s, this species of antelope survived in the harsh semi-desert Kalahari environs by doing what wildebeest do best – migrating to find water and greener pastures. Today, migration to permanent water sources north of the Kalahari is no longer possible, and wildebeest have had to adapt quickly to modern conditions to survive. Despite the impressive size of protected areas in Botswana, wildebeest in the Central Kalahari Game Reserve (CKGR) today are all but cut-off from their historical migratory routes. Extensive fences meant to reduce disease transmission from wildlife to livestock, and to control livestock movement were erected since the late 50's, with dire consequences for wildebeest. The wildebeest population in the Kalahari ecosystem (extending West and South of the CKGR, see map) crashed from over 250,000 in the late 70’s to just over 20,000 in 2015 (figures from reports for and by the government of Botswana in 1980 and 2015, respectively). Conserving the remaining Kalahari wildebeest, and allowing their numbers to recover, requires in-depth understanding of their current situation. To develop this understanding, Kalahari Research and Conservation conducted an in-depth wildebeest research project in the Central Kalahari Game Reserve. Dr. Moses Selebatso, the project leader, tracked wildebeest movement in the CKGR using satellite collars on females from several different herds. The movement patterns were examined in conjunction with grassland studies to find out more about where these survivors go and what they eat. 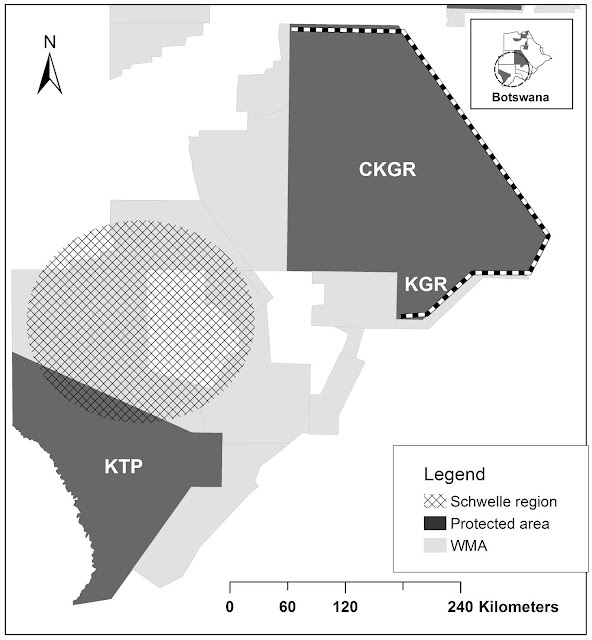 This work produced three scientific journal articles, and practical recommendations for conserving Botswana’s remaining wildebeest, both in the CKGR and throughout the greater Kalahari ecosystem. Dr. Selebatso and his colleagues discovered that most of the wildebeest in the CKGR now stay around artificially pumped waterholes, ‘hanging tough’ during the long dry season as the grass around them slowly disappears. The permanent waterholes were created in 1984, in response to the mass die-off of wildebeest and other water-dependent animals due to the then newly erected fences. As the CKGR has no natural water sources that last throughout the dry season, the artificially pumped pans are a lifeline for wildebeest. However, his studies found that this human intervention can be a double-edged sword for wildebeest. Waterholes in the CKGR are located in pans and valleys, and the soil around these pans is mineral rich, which means that the grass growing here is highly nutritious. As an added bonus, these grasslands have few trees and shrubs, which means that herbivores can spot predators coming from a good distance. The combination of water, high-quality food, and limited predation risk makes these pans highly attractive for wildebeest. However, during the dry season (when the pans would have dried up, historically), the wildebeest have little choice but to stay close to the pans, as water is pumped into them from boreholes. As the grass around the pans dries up, the amount of food available for the wildebeest dwindles. In the late dry season, daytime temperatures soar to over 40 degrees Celsius, making it too hot for wildebeest to graze in the middle of the day. The research team wanted to know what these herds would do in the face of declining food, and they predicted that they would start to feed at night during the hottest, driest time of the year. This would make them extremely vulnerable to nocturnal predators, but it could be their only option. Contrary to predictions, wildebeest chose rather to hunker down near their favoured water points day and night. They moved much less in the hot dry season than they did at other times of the year, most likely a strategy to conserve energy while they wait for the first rains. The researchers found yet another reason to worry about the effect of pumped waterholes on wildebeest and other wildlife in the Kalahari. They tested the water quality in 12 waterholes throughout the CKGR and Khutse GR. Coming from deep ground water, rather than rainfall, eight of these water points failed the overall water quality test developed for livestock (similar standards for wildlife are unavailable). Even more disconcerting, three of the water points had toxic levels of lead, and four had toxic levels of arsenic. To what extent the wildebeest herds that rely on these waterholes are affected by the poor water quality remains unknown, but it is likely to hamper their ability to survive and reproduce. Interestingly, one herd of wildebeest monitored during this study behaved entirely differently to the others. At the onset of the dry season they started to move south, away from the pans in the north. Southern CKGR has no pumped waterholes, yet this herd spent the early (cold) dry season in this area. Towards the latter part of the dry season, as temperatures increased, with associated increases in heat and water stress levels, the wildebeest headed even further south, entering the Khutse Game Reserve and neighbouring Wildlife Management Areas. 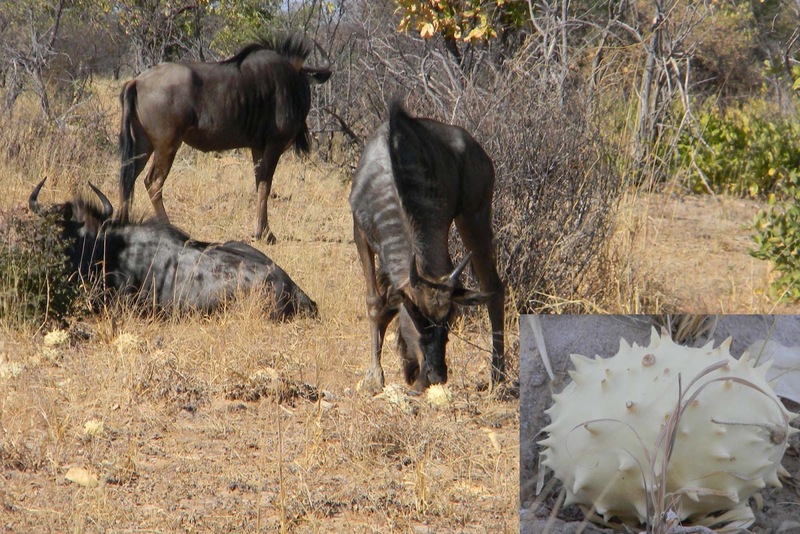 The herd did not visit any known source of water, and the researchers explained this herd’s survival by showing that they eat water bearing plants such as tsamma melons and gemsbok cucumber. These plants are well known as a source of moisture for a host of other desert-dwelling animals (e.g. gemsbok), and this study further confirms the value of these plants to wildebeest in the Kalahari. This fascinating finding poses a number of questions about artificially maintaining water points. Does the provision of water through the dry season discourage wildebeest migration, to their detriment? Are the migrating wildebeest maintaining better body condition by migrating, even though they are not conserving their energy? Are the sedentary wildebeest damaging the grasslands they rely on by grazing them throughout the year, rather than migrating? Are the wildebeest that do not use waterholes in the dry season healthier than the others, which may be affected by poor water quality? What is the future of wildebeest in this continually changing landscape, with its associated human interventions? Dr. Selebatso and his team will no doubt seek answers to these questions through further research. One potentially critical problem with artificial water points was clearly demonstrated during their 2011-2014 study. “Four of the water pumps broke down in different times during our study period, causing the water in these pans to dry up,” explains Dr. Selebatso, “this led to seven of our ten study animals walking long distances to find water, five of which died in the process.” Meanwhile, the wildebeest herd that adapted by migrating were not affected by water pump failures. This is an important lesson for managing protected areas: once humans have intervened, animals adapt to the new conditions, and any changes in those interventions could have negative repercussions. Maintaining artificial water points has now become essential for wildebeest that have lost their ability to migrate. The future of the Kalahari ecosystem can be positive, both in terms of economic return and biodiversity conservation, if land use plans make full use of the knowledge gained from important studies such as these done by Dr. Selebatso and his colleagues. Wildebeest, like many other Kalahari residents, are tough and adaptable, yet still vulnerable to human decision-making. Their future is in our hands. To find out more about Kalahari Research and Conservation, click here. Dr. Moses Selebatso provided valuable input for this article. This important study was funded by Denver Zoo Foundation, SAVE Wildlife Conservation Fund, Comanis Foundation, Kanabo Conservation Link, Wilderness Wildlife Trust, and Office of Research and Development (University of Botswana).